Prudential Financial, Inc., L+M Development Partners, and The Goldman Sachs Group, in partnership with Citi Community Capital, today joined Newark Mayor Ras Baraka to celebrate the grand opening of the historic Hahne & Company building in downtown Newark. The restored building features an arts and cultural center operated by Rutgers University-Newark and around 75,000 square feet of new retail space on Broad Street, including Newark’s first Whole Foods. The project was accomplished with support from local co-developers Hanini Group and Crawford Street Partners. In addition to retail, commercial and community space the development includes 160 new apartments—64 of which are set aside as affordable homes for low-income and working families earning between 40 and 60 percent AMI. The new homes are located on the third and fourth floors of the existing Hahne’s building and in a new nine-story residential building on the corner of New and Halsey Streets, which will connect to Hahne’s through a shared lobby and public atrium. Chef and restaurateur Marcus Samuelsson plans to open a 2,250 square-foot restaurant on the Halsey Street side of the building. Located across the street from Military Park and adjacent to Prudential’s new 20-story office building, the rehabilitated 400,000-square-foot Hahne’s building will serve as a hub for artistic and technological innovation and connect the diverse communities located in the downtown area. The hallmark of this effort is Express Newark, an arts incubator conceived by Rutgers-Newark faculty, staff, and students, with community arts leaders. The 50,000 square-foot facility designed by KSS Architects fosters creative collaboration, and features state-of-the-art learning spaces, including a 3D printing studio, a photographic portrait studio, video production teaching facilities, smart classrooms, and galleries. The space will also serve as the new home for Rutgers’ Department of Arts, Culture and Media. The retail centerpiece of the Hahne’s building is Newark’s first Whole Foods Market, which will occupy 30,000 square-feet of ground floor retail space at the corner of Broad and New Streets. The store has put a large emphasis on healthy eating education and community partnership through a variety of events in advance of its opening this coming March. In December 2016, the development team announced that Barnes & Noble College, a subsidiary of Barnes & Noble Education, Inc., will occupy 10,000 square feet across two floors in the building—the first bookstore to open in downtown Newark in decades. The location will become the new Rutgers University-Newark campus bookstore and serve students, faculty and the greater Newark community. It is scheduled to open in late winter 2017. Other tenants include City National Bank, which plans to relocate its headquarters to the building. The $174 million renovation was financed through a partnership of public, non-profit and private groups including sizable commitments from the New Jersey Housing and Mortgage Finance Agency and New Jersey Economic Development Authority. Private equity was provided by L+M, Prudential and Goldman Sachs, and debt was provided by Citi Community Capital, Morgan Stanley and three non-profit CDFIs: New Jersey Community Capital, the Low-Income Investment Fund and The Reinvestment Fund. Beyer Blinder Belle, a New York firm specializing in historic preservation, was the lead architects. The New Jersey-based Inglese Architecture + Engineering provided architecture, MEP, and construction administration services. The Hahne & Company department store was designed by architect Goldwin Starrett and built by prominent local businessman Julius Hahne in 1901. It was the first commercial building in Newark designed specifically as a department store. The Art Deco store was the company’s flagship and boasted a spectacular four-story atrium in the center of the building. In 1987, Hahne’s was sold to May Department Stores Co., owner of Lord & Taylor, and the building has remained vacant since then. The building was listed on the National Register of Historic Places in 1994. 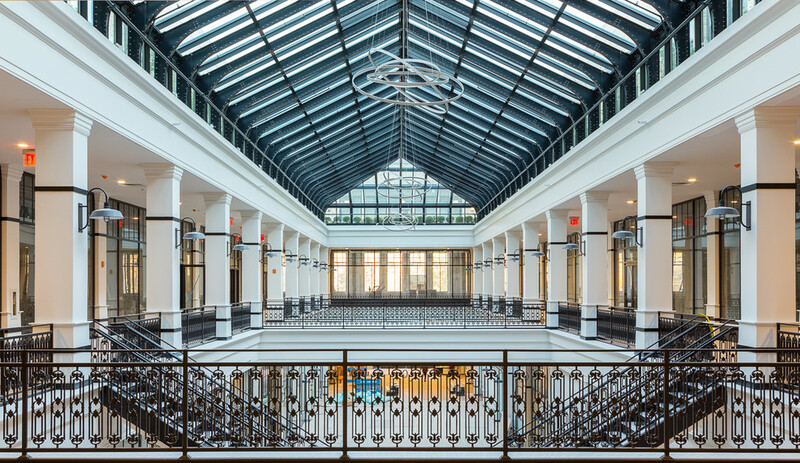 To honor the historic significance of the building, the project preserved key elements of the four-story former department store, including the façade, the original signage and the building’s expansive skylight. The skylight was dismantled, fully restored and reinstalled piece-by-piece in the new retail arcade as a reference to the department store’s dramatic former shopping atrium. New windows and retail storefronts were designed to closely match historic precedents and meet modern energy conservation requirements. All modifications and improvements to the building were reviewed and approved by both the New Jersey State Historic Preservation Office (NJSHPO) and the City of Newark Landmarks & Historic Preservation Commission, with input and support from many local neighborhood and preservation community groups.